I don't know about you, but it's easy for me to dwell on what I can't do well, rather than on what I can do well. Satan knows that if he can be distract me by having me compare myself to others that I will be drawn away from the gifts and talents that God has given me. Satan has come to steal and destroy, but Christ came to give us abundant life. Recently I was encouraging one of our children to focus on what he has been given rather than on what he doesn't have. I tried explaining to him that Satan would love to steal his joy and contentment and he does that by tempting us to focus on the blessings of others rather than on our own. Do you feel discouraged? Distracted? Empty? Perhaps you're comparing your weaknesses to the strengths of others. The old saying "apples to apples" applies. 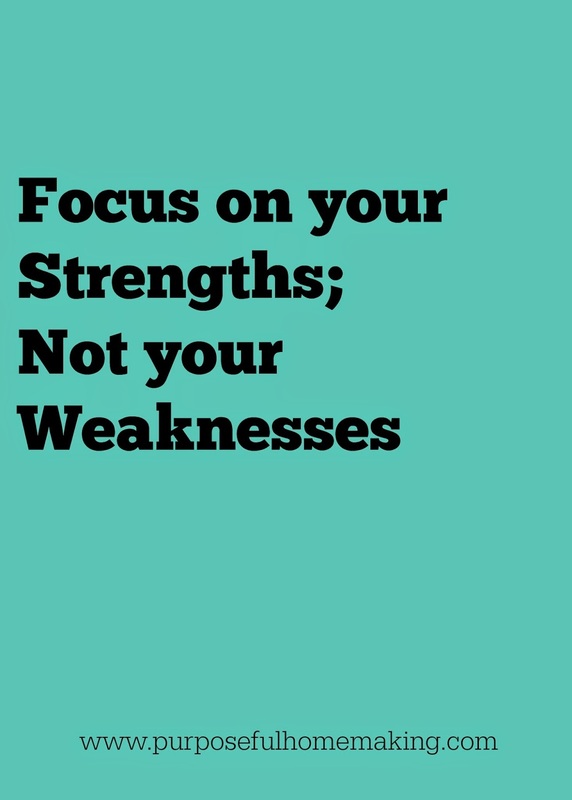 It's not fair to compare your weaknesses to others' strengths. God has equipped each of us in unique ways and with different strengths. Instead, take some time to write down what areas of strength God has given you and begin to focus on those. How can you use those talents and strengths to better help your family? How does God want you to use them to glorify Him or to help others in your life? That's not to say that we don't seek to improve areas that we are in weak in, but we certainly don't let them become the driving force that drags us down. Do you need help in getting organized, meal planning, homeschooling, or being a wife that is committed to serving her husband? We all struggle in different areas, but as the body of Christ, we are to let our strengths help cover someone else's weaknesses and vice versa. One way that is done is through mentorship. Perhaps you can find an older woman in your church that could pray for you and offer advice when needed? It's unreasonable to think that we should have it together in every area of our life, but thankfully, there are numerous resources out there to help equip us as wives and mothers. In spite of all the pressure in our society to be perfect in every way, we know that is just not possible. In fact, Christ's strength is made perfect in our weakness. We are ordinary women who happen to have an extraordinary God behind us that is infusing us with His strength. Aren't you glad it's actually better to not have it all together?? (Big sigh of relief). God wants us to acknowledge our weakness and to depend on Him. It is then that we will see incredible things accomplished.